Here are the original mini pennants. I have seen the Ebbets large pennants for at least 5 or so different teams from this set. So is this a fantasy piece too? I saw it in person and it certainly appeared to have some age to it. Last edited by effe; 04-10-2019 at 08:46 AM. No, that is a different design compared to the Brewers BF3. So you don't think it was a Red Ball? It certainly appears similar. Last edited by effe; 04-10-2019 at 09:11 AM. It is an absolute certainty that your pennant wasn't issued from Red Ball. 1. The didn't issue large pennants of minor league teams. 2. They only issued one mini pennant for the Brewers. You can see it in the previous pic I posted. Okay thanks! But you can certainly see why asked. The do look very similar in design. Red Ball issued large pennants as premiums, but only of the 16 MLB teams in the styles show in the salesman sample book. The large pennants are pretty much identical to their mini pennant counterparts. 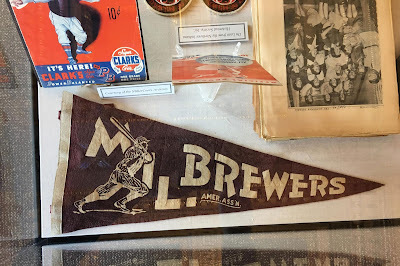 At least your Brewers Pennant is authentic and of the era, as opposed to the other example. Yours has proper aging, a correct spine and painted/screened graphics (as opposed to the tell-tale raised velvet). I have no opinion on the authenticity of this pennant. But, I did want to address your question about the felt letters/graphics and the way some manufacturers affixed these to the body of the pennant. You are correct that most manufacturers would sew the letters on. This was commonplace through the 1920s and 30s until screened/painted designs became the norm. BUT, there was at least one manufacturer that glued the letters to the body. 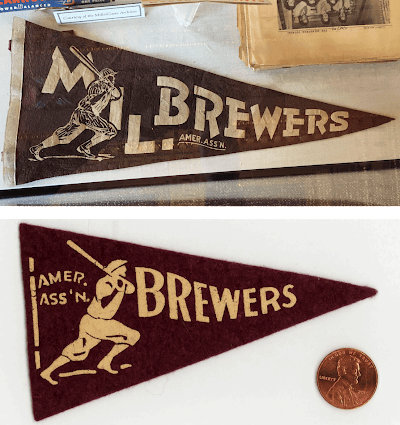 If you're able to examine one of these pennants in person, it'll be fairly obvious that the letters are felt; but, on the reverse, there'll be no stitching outlining the spot where each letter sits. I suspect this was done to lower production costs. Running a sewing machine takes time and and an experienced operator. Glue ... not so much. I don't think this production method ever really caught on. For one, glue tends to crack when a pennant is waved back and forth. It also breaks down with time. It had to be cheaper to just screen print the lettering and be done with it. Time to defibrillate this thread...CLEAR!!!! This baby just sold on Ebay while listed as an International League minor league baseball pennant...However, I feel that's wrong. This pennant is made of 1960s material (the baseball Bears disappeared around 1949) which would make it a Newark Bears Continental Football League pennant. The spine and tassels also scream 1960s. Curious what others thought. Last edited by Fballguy; 04-16-2019 at 08:54 PM. Don’t know, Rob, but it’s a great pennant. What did it go for? $144. Hope the buyer is a football fan. I would lean towards football as well. I have seen a few late 1940s Pennants with this cloth material and sporting these "flimsy" type of tassels. That Brooklyn Dodgers Football Pennant with the Bum would be one example. But this cloth material and construction was far more prevalent from the late 1950s to mid 1960s. It could conceivably be either Baseball or Football, but I'd lean pretty heavily towards Football. The Bear logo looks more "football-ish" as well. I don't know the color scheme for either team off the top of my head. But would guess this pennant was once light-to-medium blue, and has since faded to grey. Perhaps it would help to research the colors for the two teams, if anyone here wants to invest the time. That could help narrow it down as well. Just arrived today. An unusual green Houston Oilers pennant. Love it! Especially the oil rig worker, kicking the ball. Wow.... That arrived fast! Why does my stuff always take 3 weeks or more? Great pickup of a super-rare one, Marc! Thanks, guys. It only had to travel about 3 hours down I45. They shipped it in what I would call a "brick" of cardboard, about 4 flat sheets on top and 4 on the bottom. It might have stopped a bullet. I'll take it over the pennant oragami that I've been receiving lately. Congrats Mark! I was an early bidder but I bowed out pretty early. Damn that 28.25% Buyer's Premium in Texas. Yeah, buying from Heritage is tough when you live in Texas. Here are a few others I've picked up over the past few months. The Giants pennant is an upgrade. The Houston All Star Game pennant has been elusive. And the random yellow circa 1983 unlicensed 49ers pennant may be the most difficult to find. Those are all tougher than one would think. Nice pick ups. I have the Yankees version of that Giants pennant where they added another piece of fabric on the pennant saying “Giant Killers”. Odd pennant.